PSORIASIS IS A CHRONIC SCALING DISEASE of the skin. It may range from just a few spots anywhere on the body to large areas of involvement. It is not contagious or spreadable from one part of the body to another or from one person to another. The exact cause of psoriasis is unknown, but hereditary and genetic factors are important. Psoriasis runs in families. This does not mean, however, that every child of a parent with psoriasis will develop psoriasis, but it is common that somewhere down the line psoriasis will appear in families. Psoriasis is not caused by allergies, infections, dietary deficiencies or excesses, or nervous tension. There are different types of psoriasis. However, chronic plaque psoriasis (described below) is by far the most common and typical type. Between 8 and 9 out of 10 people with psoriasis have chronic plaque psoriasis. The rash is made up of patches on the skin, called plaques. 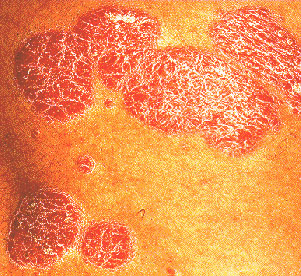 The picture shows typical plaques of psoriasis next to some normal skin. Each plaque usually looks pink or red with overlying flaky, silvery-white scales that feel rough. There is usually a sharp border between the edge of a plaque and normal skin. The most common areas affected are over elbows and knees, the scalp, and the lower back. However, plaques may appear anywhere on the skin. But, they do not usually occur on the face. The extent of the rash varies between different people, and can also vary from time to time in the same person. Many people have just a few small plaques of a centimetre or so when their psoriasis flares up. Others have a more widespread rash with large plaques of several centimetres across. Sometimes, small plaques that are near to each other merge to form large plaques. Chronic plaque psoriasis can be itchy, but it does not usually cause too much discomfort. Scalp psoriasis: about half of people with chronic plaque psoriasis affecting the skin of their body will also have psoriasis affecting their scalp. However, scalp psoriasis may occur alone in some people. Scalp psoriasis is usually a form of chronic plaque psoriasis. It looks like severe dandruff. The whole scalp may be affected, or there may just be a few patches. If severe, it can lead to hair loss in some people. Flexural psoriasis: this is also a type of chronic plaque psoriasis. It occurs in the creases of the skin (flexures) such as in the armpit, groin, under breasts, and in skin folds. The affected skin looks slightly different to the typical plaque psoriasis. It is red and inflamed but the skin is smooth and does not have the rough scaling. This type of psoriasis usually just affects the palms of the hands and soles of the feet. In this situation it is sometimes called palmoplantar pustulosis. Affected skin develops crops of pustules, which are small fluid-filled spots. The pustules do not contain germs (bacteria) and are not infectious. The skin under and around the pustules is usually red and tender. Pustular psoriasis that just affects the palms and soles is the second most common type of psoriasis. Rarely, a form of pustular psoriasis can affect skin apart from the palms and soles. This more widespread form is a more serious form of psoriasis and needs urgent treatment under the care of a dermatologist (skin specialist). About half of people with any type of psoriasis can have fingernail psoriasis. In some people toenails are also affected. Nail psoriasis may also occur alone without the skin rash. There are pinhead-sized pits (small indentations) in the nails. Sometimes, the nail becomes loose on the the nail bed. Nails may also change colour and the area around the bed of the nail can become orange/yellow. See also the separate leaflet called Psoriatic Nail Disease. This typically occurs following a sore throat which is caused by a bacterium (germ). Round/oval plaques of psoriasis are small (less than 1 cm - drop size) but occur over many areas of the body. Guttate psoriasis normally lasts a few weeks, and then fades away. However, it may last for three to four months in some people. In many people, once it goes it never returns. This type of psoriasis causes a widespread erythema (redness) of much of the skin surface, which is painful. Individual plaques of psoriasis cannot be seen because they have merged together. There is still redness and scaling of the skin and the skin feels warm to touch. A person with erythrodermic psoriasis may also have a fever. This type of psoriasis is rare, but it is serious and needs urgent treatment and admission to hospital. This is because it can interfere with the bodys ability to control temperature and it can cause excessive protein and fluid loss, leading to dehydration, heart failure and severe illness.